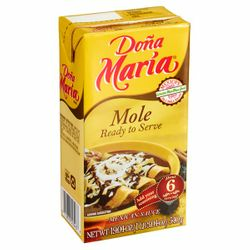 RTS - Ready to Serve Mole cholesterol Free by Dona Maria makes 6 sevings or portions. Shake before opening. In saucepan, heat 1 teaspoon of olive oil, add Dona Maria Mole ready to serve to the pan. Bring sauce to a boil and heat for 2 minutes or ntil hot. Enjoy! In a microwave, empty the contents of the package into a microwaveable bowl. Lightly cover and heat for 2 minutos or until hot. Enjoy. 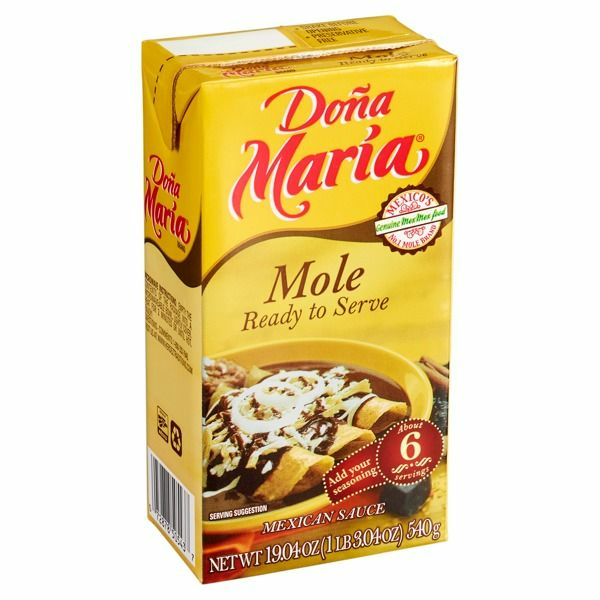 El Mole Dona Maria listo para servir, solo necesitas calentar y servirlo con tus platillos favoritos. Este paquete sirva para 6 porciones. Lo puedes usar como condimento para platillos con carne de res, cerdo, pollo y pavo, pescados y mariscos, verduras, huevo y platillos a base de tortilla como las enchiladas de mole. Agitar el envase ants de abrirlo, posteriormente calentar 1 cucharada de aceite en una cacerola a fuego medio, agregar el mole, dejar hervir y agregar carne cocida o verduaras al gusto. hervir durante 2 minutos a fuego medio y listo. Buen provecho! It's good mole sauce and far easier than making it yourself!!! It is so hard to find this item in the stores. I am very pleased with my purchase. As a matter of fact we had some again last night. ProsLove the,fact i can get it from mex grocer, its,gard to find where i live. Absolutely delicious! My husband is Mexican and extremely picky when it comes to food. He and I both thoroughly enjoyed this. No need to add anything but the chicken. Matter of fact I cheated. I simmered rotisserie chicken in the sauce and served with white rice and tortillas... I can't wait to have it again.